blog.HalloweenAdventure.com | Latest News from the Costumes Trend FrontLines! : Iron Man is here! Iron Man is born Anthony Edward "Tony" Stark. During a kidnapping, he suffers a heart injury and is forced to created a destructive weapon. Instead, he chooses to create a power suit and helps protect the world as a superhero. He is a wealthy industrialist and genius inventor who created military weapons and whose metal suit is laden with technological devices that enable him to fight crime. In the 2008 live action film, Iron Man is played by Robert Downey Jr. Recreate the smash hit blockbuster with our myriad of Iron Man costumes. 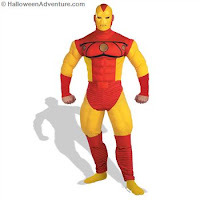 Men will love our Iron Man 2008 Muscle Man Movie Costume. Costume includes a muscle torso and golden helmet. Pants aren’t included, but we’d recommend a black pair to go with the red and black color scheme of the muscle top. This is an officially licensed Iron Man costume. If the original comic book Iron Man is more your thing, you’re in luck! Our Iron Man Muscle Adult Cartoon Costume is the perfect antidote to all the movie hype. It’s the real thing, a costume based on the Marvel® comic book character. The Red and Yellow outfit includes a plastic 2-piece mask (front & back pieces that Velcro together) and bodysuit with muscle torso and legs. 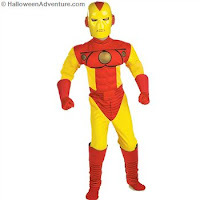 Youngins in the mood to recreate the Iron Man look can snag our Iron Man Muscle Children’s Cartoon Costume. 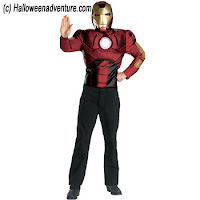 Just like millionaire inventor Tony Stark, transform yourself into a hero by wearing this officially licensed Iron Man™ costume based on the Marvel® comic book character. The Red and Yellow outfit includes a bodysuit with torso muscles and plastic character facemask (only covers the face). For more superhero costume ideas, try a Spiderman or Batman costume. Look out world, you’ve arrived! Remember, time is running out to get your costume. Don’t let the days slip away. Head over to Halloween Adventures ASAP and get your costume before it’s too late!